"I'm happy it was a PR, and to do it almost all by myself, I'm really happy." "I was definitely nervous, with all of those sharp college guys sitting right behind me." - American 10,000-meter record holder Chris Solinsky after opening his 2011 campaign in impressive fashion with a 3:54 mile win over the college boys on Saturday. For the record, Saturday, 2/12/2011, should be remembered as the day that US male collegiate distance running reached an all-time high, as for the weekend there were at least 10 collegiate sub-4s, including a 3:55 by collegiate Miles Batty (Who the hell is that? Had anyone ever heard of him? We have no idea except he's now a stud), plus 10 auto 3k qualifiers in a single race. Ridiculous. 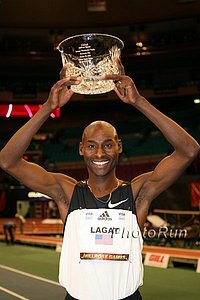 Lagat Going for AR 2 Mile, Lukas Verzbicas Shooting For Gerry Lindgren's 46-Year-Old Record In Armory 2 Mile With Lagat *Husky Classic In Seattle German Fernandez vs. Sam Chelenga in the 3k along with Alan Webb. Alan Webb Update: He Is Running 3k Today Vs. German Fernandez And Chelanga, Salazar Says Webb "Overreacted" After Mile In Boston Webb's 3,000m should be sometime between 7:50-8:30pm Eastern and will be streamed live.